* Lew's comments on Andreas Dorpalen's "Hindenburg and the Weimar Republic"
« * CASE CLOSED – Lew’s novel about the anthrax attacks and the failed FBI investigation – has been re-published. In this interview, Lew explains why perhaps his novel is closer to the truth than anything the FBI is asserting. Recommends it for: Everyone who enjoys a great story told well. If I kept a GR shelf for family sagas, this book would be proudly placed there along withThe Pillars of the Earth, Gone With the Wind, and The Age Of Innocence. In my mind they are all historical novels which describe families and their trials and tribulations of living in troubling and/or interesting times. An historic telling of the treatment, by the Catholic church, of the Jews in Spain, leading up to the period of the Spanish inquisition. I have read a number of books about the annihilation of the Cathars and other religious groups by the Catholic Church, and I had realized the Jews were also persecuted by the church, but this story explores not only the actions of the church, but also the tenacity and resourcefulness of the Jewish people. A slowish read but a thoroughly interesting story. I approached The Heretic with a small amount of trepidation because, as a gentile, I wasn’t certain that I would follow the passages of the explanation of the Jewish faith which I knew to be contained in the book. I loved this book! Tells a part of European history I knew little about. “The Heretic” explains the rationale of the Catholic Church used to persecute the Jews of Spain. Lessons for our own time. I want to learn more about the Spanish Inquisition period so I am now reading the newly released book “Isabella The Warrior Queen” by Kirstin Downey. Looks to be another very interesting book. I would assume that most people who consider reading THE HERETIC are familiar with the details of that tragic period of Jewish and Catholic history. 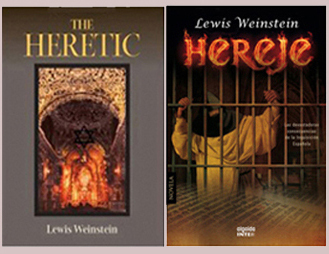 While Lewis Weinstein’s scholarly novel does give the usual details about the predetermined trials, the tortures, and the burning of its victims, particularly at the end of the book, THE HERETIC goes much deeper into its causes. I’m not sure where to start with my review of Lewis Weinstein’s ‘The Heretic’, so I’ll start by saying that it was a damn good read. I think that part of my problem here is that I read the sequel first, and while both books are very good works of fiction in their own right, there’s always a little less suspense when one knows, even in the broadest terms, what is going to happen down the line. The Heretic is a wonderfully written novel about the Spanish Inquisition and the impact it had on the Jewish population in the 15th century. In Lewis Weinstein’s able hands, the history of Jewish culture trying to survive the Anti-Semitic acts of that era survive. In fact, Weinstein describes with great deft, the roots of Anti-Semitic views in Europe. A great read and strong reminders of how powerful fear can be in causing good people to hate each other. I also loved the deep loving marriages. The characters were very real, the dialogue honest, the descriptions vivit and the facts (historical and biblical) so well researched that I learned a great deal while enjoying a wonderful story. Thank you Lewis. I found this book written about religious intolerance in Fifteenth-Century Spain interesting and informative and quite shocking. The descriptions of characters, costumes,scenery,landscapes and religious traditions made this book come alive for me.A Good read, this book really opened my mind about religious thought and dogma. I recommend this book to all. I am Catholic. My entire life I have had friends that are Jewish. Until reading this compelling novel did I really understand their feelings towards Christianity. This book is a must read. Everyone, be you Christian, Catholic, Jewish….matters not this is a book which will open your eyes and broaden your knowledge of how religious persecution took place. You will be astonished at how religion was used to severly punish people – so times for no good reason. you owe it yo yourself to put this book as a must read..when you are done you will have a much better understanding of our human race. GREAT BOOK! Thank you Lewis Weinstein for this fabulous book! It moved me so deeply… I admire your art and your research. “The Heretic” educated me, and the Catalan family now lives in my heart. Excellent historical novel; don’t miss it! Our reading group gave it 5 stars. Compelling read about conversos surviving on the eve of the Spanish inquisition. This was in limited release and hard to track down, but it was worth it. This entry was posted on August 16, 2015 at 2:46 pm	and is filed under *** Uncategorized. You can follow any responses to this entry through the RSS 2.0 feed. You can skip to the end and leave a response. Pinging is currently not allowed.